Denny’s, known for being open to giving consumers the choice and variety they want, is extending that mantra to a diner menu favorite – pancakes. 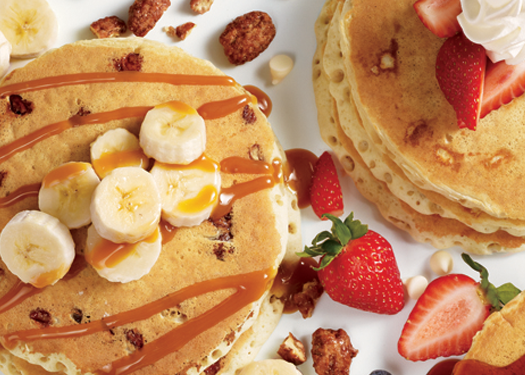 With the launch of their new “Build Your Own Pancakes” menu, Denny’s is providing diners with more choice than ever before, satisfying sweet or savory cravings as well as the desire to design your meal. The new menu features a collection of fluffy creations as well as the option to build your own delectable dish from a variety of selections. Choose your batter: Buttermilk and hearty wheat batters will please even the pickiest of pancake eaters. Choose your mix-in: Glazed pecans, diced bacon, chocolate chips, white chocolate chips and blueberries provide endless ways to make your pancake taste delicious. Choose your topping: Diners will need to give great deliberation over the tasty toppings available- fresh strawberries, fresh banana slices, caramel sauce, hot fudge, raspberry sauce and peanut butter sauce are all available to sit atop their pancake stacks. The optional addition of whipped cream will give diners a seriously sweet ending to their handiwork. If diners aren’t in the mood to build their own creation they can choose one of Denny’s delicious pancake designs, all available in short or tall stacks and served with two eggs cooked to order, two bacon strips or two sausage links and a choice of either hash browns, seasoned red-skinned potatoes or grits. Sweet Pecana ‘Nana is as fun to say as it is to eat; a buttermilk batter with glazed pecans gives you a sweet start, allowing diners to enjoy fresh banana slices and caramel sauce toppings. Not much beats a pancake with peanut butter, except a pancake with peanut butter and chocolate! This classic flavor combination starts with a buttermilk batter and includes chocolate chips, white chocolate chips, hot fudge and peanut butter sauce. The addition of blueberries in a buttermilk batter will have you wondering why you never ditched the muffins many years ago. White chocolate chips and whipped cream complete this sweet treat. This fruity fusion with hearty wheat batter is some healthy deliciousness; mixed in blueberries and sliced banana toppings offer fewer than 15g of fat, over 20g of protein and 8g of fiber when served with egg whites, seasoned red-skinned potatoes and turkey bacon. This creamy strawberry sensation begins with buttermilk batter and offers white chocolate chips, fresh strawberries and whipped cream to top it off.